Here’s a scoop for you: The so-called “Green New Deal,” onto which 70 leading Democrats have signed, doesn’t exist. Like a salesman parked at a corner hawking a small bottle filled with a mystery substance that will cure everything from insomnia to cancer, the Democratic Party is promoting a fraud-work quilt promising a cure for all. In reality, this hoax targeting the liberal base, GenXers and progressives, is nothing more than an elaborate Get Out the Vote organizing effort. As a former community organizer, I respect that work when it’s about real proposals, actual legislation and serious ideas. Yet, courtesy of a letter being sent by Rep. Alexandria Ocasio-Cortez of New York to Democratic colleagues in the House of Representatives, we now know that there is no package of implementable ideas or policy. What they do have is a press release word salad of platitudes, slogans and talking points. No one knows, because it doesn’t exist. Sounds like a cultural revolution to me. What’s the “fair and just transition for all communities” she’s talking about? Vague enough to be modeled on Pol Pot or Chairman Mao Zedong or maybe just Martha Stewart. Who knows, and that’s the point. “The resolution will also call for clean air and water, climate resiliency, healthy food, access to nature and ‘a sustainable environment for all for generations to come,’ according to the letter. Lastly, the Green New Deal will ‘promote justice and equity by preventing current and repairing historic oppression to frontline and vulnerable communities,” the newswire reported. Further proof of the lack of seriousness is this outrageous pitching of “protecting vulnerable communities,” as the young woman in front of this charade has said nothing in opposition to her party moving in several states to legitimize infanticide. In December 2018, in a story about the genesis of the scheme, the New Yorker magazine inadvertently exposed the real agenda. “Sunrise, founded a year and a half ago by a dozen or so twentysomethings, began its campaign for the Green New Deal last month, when two hundred activists occupied Nancy Pelosi’s office a week after the midterm elections. The movement has allied with the incoming congresswoman Alexandria Ocasio-Cortez. … Inside Luther Place Memorial Church, cheers erupted as activists unfurled a yellow and black ‘green new deal now’ banner from the balcony. The crowd hushed as the first speaker, Varshini Prakash, came to the microphone. Prakash … is one of Sunrise’s co-founders. She later told me that a highlight of her activism career was when she participated in a musical disruption of a Trump administration panel at the United Nations climate conference in Bonn, in 2017…” the New Yorker reported. Further, the New Yorker reported that the founders of “Sunrise” met through groups such as Occupy Wall Street and Black Lives Matter. The Sunrise Movement’s website makes it clear — its members are all about organizing at the local level, highlighting their goal to “Build our movement in every corner of the country so we can reach the millions of young people who are scared about climate and keep building support for a Green New Deal.” Which, as we now know, is an apparition. But one does need a cause — preferably one that is malleable and pushes all the right emotional buttons. No one asked former President Barack Obama for specifics of his “hope and change” plan, and we all know how that worked out. Now the same leftists trust you won’t ask for specifics as they plan the next round of wrecking your life. • Tammy Bruce, president of Independent Women’s Voice, author and Fox News contributor, is a radio talk show host. Gee, I guess we have to pass it to see what’s in it besides hot air? As far as her “ideas” working to lift Americans, as one out of 1,024 members of E. Warren’s family might say: How? Exactly. You need to pass it to know what’s in it. C’mon Nancy, you invented this method of legislating. Might as well wear that stupidity like a badge of honor. In the current SJW meltdown climate, the only way you’re going to beat AOC is to out-stupid her. The idiots in congress seem to forget what their jobs are, the JOB DESCRIPTION is clearly outlined in the Constitution. Their primary function is WORK ON THE AMERICAN PEOPLES behalf. Not fulfill a dream of a UTOPIA where government is going to take care of all our needs. If Democrats and Republicans cannot agree in congress, she actually thinks 325 million people would accept her idiotic idea? Eliminating fossil fuels would eliminate 10% of the workforce and attrition would eliminate over 30%. Then what about the 200 million plus cars that would have to be scrapped? Is the government going to start building a different type of car resulting in “competition” with automakers from other countries. The thing to take in consideration after this country has become the utopia of liberals smoking their weed and eating dog poop, hostile foreign countries will be cutting us up like conquered territory. WHEN for decades, they’ve been shown time, and time again, THERE ARE NO RAMIFICATIONS for willfully ignoring that requirement, why would they ever care about “fulfilling their duty and obligations to US THE AMERICAN CITIZENS”?? A O-C demonstrates her nearly complete ignorance of any topic merely by speaking. . . and she obviously loves to hear herself talk. Excllent point. But the sad part is, all the starry-eyed nit-wits listening to her drivel believe every word of it. She’s a leftist. Of course she’s ignorant! AOC, America’s answer to Megan Markle. What she lacks in intelligence, she makes up for in stupidity. That sums up damn near EVERYONE in the Dem party, and a good chunk of those in the GOP.. This idiot is dangerous. Why doesn’t AOC and Captn Nancy go play with the nuclear codes instead..OOpps., better not they may hit the right codes and we would all go boom. What a fake and useless individual she is, I guess BHO must have been tutoring her over the last year or so. AOC is nothing more than an even MORE clueless and toxic FEMALE version of Obama. At least AOC hasn’t said “i’ve never been proud of this nation”.. YET. She’s never said it exactly like that, but she says it every time she speaks in the way she denigrates us as a country whose only accomplishment is apparently the pervasive racism against and persecution of minorities. Same old race-baiting, identity politics CRAP these Lefitst LOONS always spew, as a way of expressing their hatred of this country. Point taken. Heck, i’d see it if she DID say it just like Obama did, she’d have hundreds of folks “CHEERING” her for doing so.. Like mindless lemmings. Stupid is as stupid does, Forrest Gump told us. He predicted the modern Dem party as it is today. People that don’t understand basics of commerce, industry or economy should not be elected to office. Mindless rhetoric will accomplish nothing and only continue as a waste of time and money. You are quite right, bigtuna, they should NOT be elected to office! But when they ARE, they can do a LOT of damage in their IGNORANCE and their fanatical ideology. Just look at all the damage OBAMA did to this country and its economy! A decent civilization building game would probably be too much of a test for most of them. They probably have never played those games.. 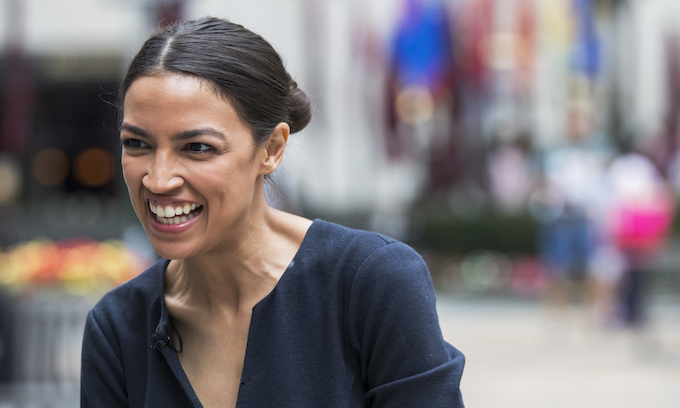 Pretty much ALL of her agenda is “platitudes without policy!” All this moron DOES is spew forth meaningless word salads composed of equal parts regurgitated Socialist catch phrases and COMPLETELY impractical and UNDOABLE pie-in-the sky, child-like fantasies. She “reasons” like a SIX-YEAR-OLD! She has NO CLUE what things cost, much LESS how to pay for or accomplish any of these grandiose fantasies of her in any practical way that might actually WORK. And, of course, she utterly FAILS to grasp that Socialism NEVER WORKS, because it demands that people act against their OWN best interests, with absolutely NO incentive or reward for doing so! She believes that the reason Venezuela is such a mess is that “they did not do Socialism right,” utterly FAILING to understand that Venezuela is a PERFECT example of where Socialism ALWAYS leads, no matter HOW it’s done! Excellent point. But the sad part is, all the starry-eyed nit-wits listening to her drivel believe every word of it. That’s cause the colleges did their work well, to brain wash them into this dogma.. The only good thing about this big- mouthed idiot she’s not from CA. where I live. We get to claim Kamala Harris, which is enough. They’re all useless & full of hot air. Piglosi also represents CA.. So you have her too! The plan is simple – Whatever makes them feel good on that particular day is “green”. Anything that doesn’t must be evil caused by some white guy somewhere. Even if they magically produced some real text for their “Green New Deal” this is what it would devolve into. Could it possibly end any other way? There is a prerequisite that some form of commerce, someone’s livelihood, be destroyed in the process. Yea, everyone in the oil/gas/coal fields..
Every time AOC opens her mouth she proves that she is too stupid to know she’s stupid. Don’t worry about her. She has all the staying power of a fart in a hurricane. It is a pity, we can’t have a ‘smarts quiz’ requirement to be in office.. That would at least keep HER and her evil ilk out of office. (Hopefully). Their socialist concept of green is always about the money, never the climate. They could hear the sound of a redistribution opportunity fart in a factory. They are like pigeons whose homing instincts to fowel another citizens financial nest egg to their own enrichment is pathological. The “New Deal” part of it is the clincher. I’m sure Occasional-Cortex is thinking, “Whoa . . . it worked for FDR! Hu-hu-huuuhhh! Every time this moron blathers about anything I want to slap the voters that put her in office. Even when she doesn’t blather on, i wanna slap the stupid out of those voters. Shrillary 2.0 …. crazier, sicker and stupider. If that’s even possible. Hello My Darling, Hello My Baby, Hello My Ragtime Gal…I don’t want to badmouth her. She’s getting plenty. In not so many words, under New Green Deal article, gov’t controls the money supply and prints more when it needs it, and they skirted the whole issue about how this causes mega-inflation (you know, how an ever-increasingly infinite amount of money, chasing a fixed amount of goods and services causes mega-inflation?) well they tried to state that the gov’t would manage it. HUH? How does a gov’t manage to print more and more money (Yet not put it into circulation, to pay for all that “Free tuition” and “Free Health Care” and Paychecks for those “Not willing to work”???? Wealth has to be created somewhere in the equation for sustainability!. If all the government does is print money, then it gets cheaper by the bucketload. Soon a $5 loaf of bread costs $100 because the government has printed so much money that its competing for Venezuela for its rate of mega-inflation!! Under this farce, expect your groceries to rise in cost much faster than your paycheck. Meanwhile the “Greenies” will be banning beef (because of cow farts), tossing you out of your home (because its not energy efficient enough), deciding where you will live and work (agenda 21) and what your pay will be (worker equity/parity). Welcome to the Brave New World, where politicians hold even more power than you think they could or SHOULD ever have!!! !